We noted yesterday that the leader of the group (“The Center For Medical Progress”) that produced the latest deceptive, heavily edited video attacking Planned Parenthood, David Daleiden, is actually a friend and associate of discredited right wing hatchet man James O’Keefe, and was a classmate at Claremont College of infamous cyberstalker Chuck C. Johnson. But today Media Matters has unearthed another even more disturbing personality in this group. 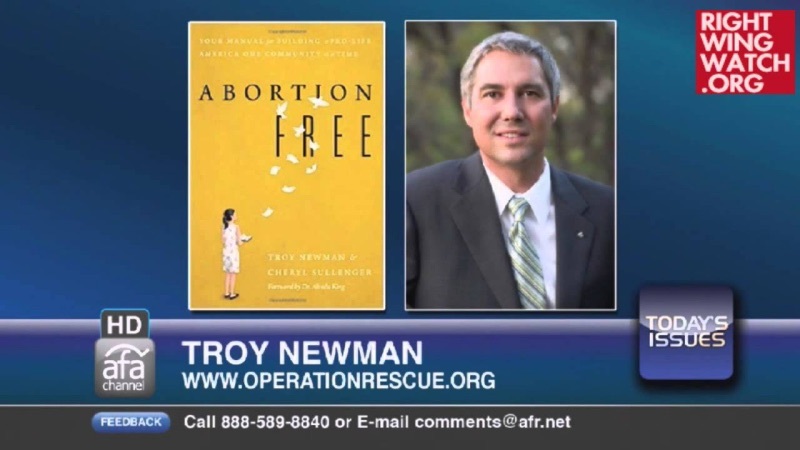 Newman Called Murder Of Abortion Clinic Doctor A “Justifiable Defensive Action.” In a 2003 press release, Newman defended Paul Jennings Hill, who was executed by lethal injection for murdering abortion doctor John Britton in Pensacola, FL. Newman argued that Hill should have been able to defend himself by classifying the murder as justifiable. Today’s scheduled execution of Paul Hill is not justice, but is another example of the judicial tyranny that is gripping our nation. A Florida judge denied Rev. Hill his right to present a defense that claimed that the killing of the abortionist was necessary to save the lives of the pre-born babies that were scheduled to be killed by abortion that day. Our system of justice is based upon ‘innocent until proven guilty,’ but in Rev. Hill’s case, there was no justice because the court prevented him from presenting the legal defense that his conduct was justifiable defensive action. Newman will pick through clinic workers’ trash to figure out where they do business; he’ll trail them at a distance to learn their routines. His goal is not just to make their lives uncomfortable. He wants to unsettle and disgust their friends and associates, so their hairstylists and their pharmacists, even their neighbors, make it clear they’re not welcome in Wichita. These are the extremists and far right operatives doing their best to push this bogus hit job into the mainstream media.